Rowe-Roberts, D., Cercos, R. and Mueller, F. Preliminary results from a study of the impact of digital activity trackers on health risk status. Studies in health technology and informatics. Investing in E-Health: People, Knowledge and Technology for a Healthy Future. 204. (2014), 143-148. Mueller, F., Muirhead, M. Understanding the Design of a Jogging Companion. 2014. ACM Conference on User Interface Systems and Technology (UIST). Work-in-Progress. ACM, 81-82. The Exertion Games Lab (exertiongameslab.org) at RMIT University (Royal Melbourne Institute of Technology, rmit.edu.au) in Melbourne, Australia, is seeking exceptional PhD candidates to research the future of digital play. capture system, the Xsens capture suit and crazyflie mini quadcopters. kiteboarding but will be also inspired by the candidate’s experience. and extreme sport culture is required. and hardware prototyping is required. You will need to have a three-year Bachelor and a Master’s degree. Expression of interest: 15 Oct 2014.
process ensures that we are able to endorse your application. corresponding to position number (in the form of a paper incl. RMIT University, School of Media & Communications (Royal Melbourne Institute of Technology (rmit.edu.au), in Melbourne, Australia is seeking an exceptional PhD candidate to research Extreme Performance. The School of Media & Communications hopes to attract a candidate who values an interdisciplinary design studio and extreme performance environment. You will be highly motivated, willing to learn a variety of skills and own initiative, extremely creative as well as technical, and also have highly developed analytical and communicative skills. Prior research experience (publications, prototypes, films, exhibitions etc.) is desirable and technical abilities in hardware prototyping, motion capture, biometrics, communications and film media (VMX) programming skills. Extreme Performance (PhD by Research 2015-17): Research, design and development of software to support the prototype development of wearable performance media hardware and remote communications systems for human performance in extreme environments: spanning activities in deep sea, alpine mountaineering and in microgravity environments. Demonstrated interest and experience with human exploration, performing arts technologies, interactive technology, and hardware prototyping and building communications platforms is desirable. A passion for sea, summit or space fieldwork will also be highly regarded. The desired candidate will demonstrate that they thrive in a convergent research culture where arts, science and technology are interrelated, and mutually informing modes of exploration, knowledge and discovery. Dr. Sarah Jane Pell (www.sarahjanepell.com) will mentor the candidate in all areas of the project, including research methods, publications and dissemination of results including interactive exhibitions. The RMIT University School of Media and Communications (SMC) incorporates the fields of art, communication, design, education, humanities, property and social sciences. SMC encourages collaborations across disciplinary boundaries, and promotes opportunities for exchange, guidance and mentoring with high caliber researchers. This project strategically and creatively contributes to the activities, values and pedagogical impact of RMIT’s goals for ‘Transforming the Future’. Do you have exceptional creativity, research excellence, passion and drive? Entry requirements: You will need a minimum of a 3year Bachelor Degree and Master’s Degree in an appropriate field plus evidence of practical experience and/or a portfolio of projects and/or expeditions. Example backgrounds may include interaction design, human-computer interaction, industrial design, communications, human movement, sports science, experimental arts, media and engineering but we are curious to know what you can contribute. All nationalities are encouraged to apply. March 2015. The position will be supervised by Dr. Florian ‘Floyd’ Mueller and Dr. Sarah Jane Pell and will conclude with a thesis and exhibition. Scholarships are available according to the Australian Postgraduate Award rate of approx. AUD 25,000 per year. We are also offering space to research and design in an open plan lab environment in the award-winning Design Hub, Australia’s newest interdisciplinary design research centre and the RMIT project-built VMX Room Studios. First, applicants will apply with an expression of interest by the date above to the email below. After the internal interview with Dr. Sarah Jane Pell, the candidate will need to apply to the general RMIT University admissions office by 31 Oct 2014. This two-step process ensures that we are able to endorse your application. 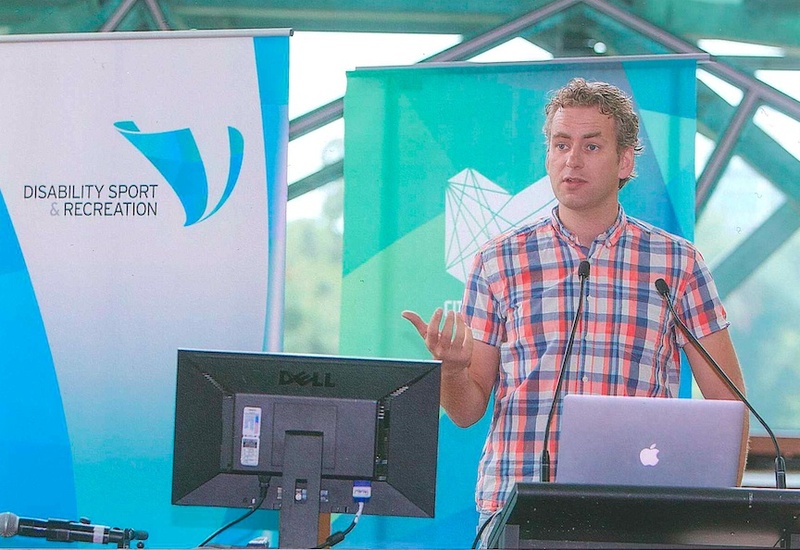 Dr. Pell is currently a member of the RMIT University Exertion Games Lab. Their research is focused on the merging of the active human body, technology and play by drawing from research streams such as interaction design, human-computer interaction and human performance. The interdisciplinary culture within the School of Media & Communications ensures that we do not just philosophise about the future, but we actively invent it, and bring it to the world. Please submit your application (CV, brief research proposal outline (Max 3 pages), transcript of latest academic results and portfolio URL) by email to SarahJane.Pell (at rmit.edu.au). We are featured on the RMIT homepage! 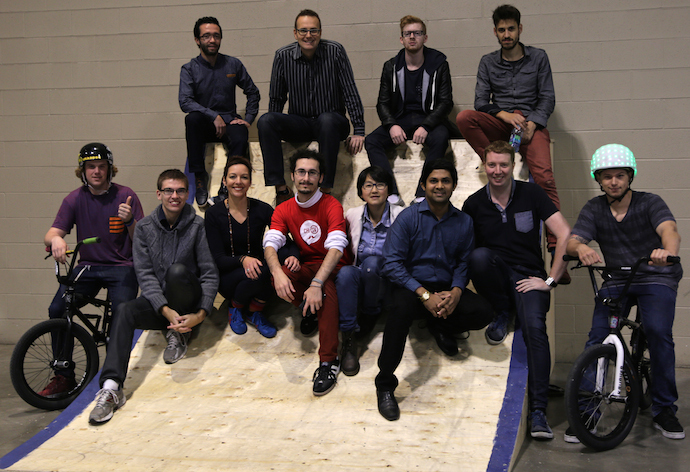 We are again on the RMIT landing page with our successes at CHI’14 and DIS’14, in the News section, well done everyone! Rohit and his collaborators at LMU in Germany have together achieved an InfoViz full paper, congratulations! Stusak, S., Tabard, A., Sauka, F., Khot, R., Butz, A. Activity Sculptures: Exploring the Impact of Physical Visualizations on Running Activity. InfoVis’14. Long paper. 10 pages. David’s work on balancing table tennis players with different skill levels was mentioned on the Yahoo News, New Zealand. 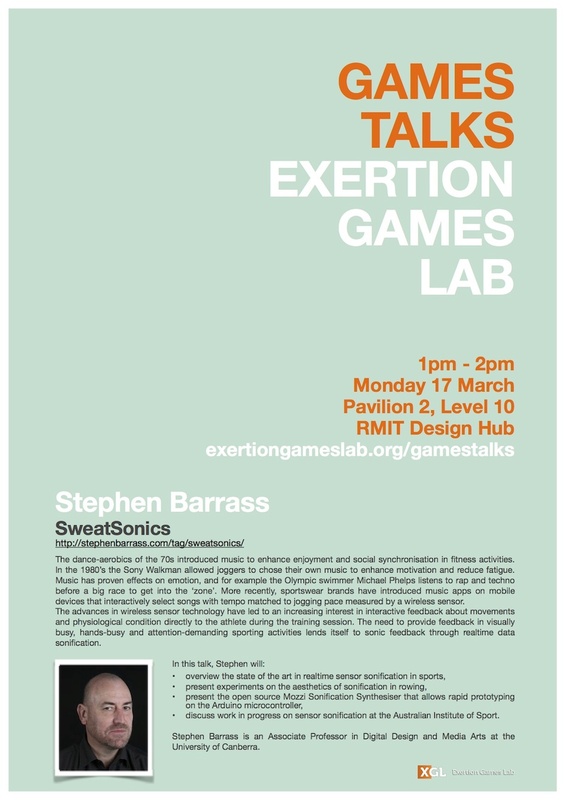 David is at HitLab NZ and was a visiting researcher at the Exertion Games Lab and will present his work at ACE 2014. We made a video of the UBISS Workshop D on Bodily Play held by Floyd and Rich in Finland. The workshop was a great success with many new and exciting games being made, thanks to everyone involved! Mueller, F., Gibbs, M.R. and Vetere, F. 2014. Designing for Social and Physical Interaction in Exertion Games. Book chapter in: Nijholt, A. (ed.) Playful User Interfaces, Springer, 227-251. Floyd, Rohit, Jayden, Amani and David will present their DIS paper in Vancouver in June. The research presents strategies on how sensing capabilities – and complementary wireless distance zones – could engage players with proxemics: the interpersonal distance between players. The work offers ubicomp and game designers novel resources for digital play. Mueller, F., Stellmach, S., Greenberg, S., Dippon, A., Boll, S., Garner, J., Khot, R., Naseem, A., Altimira, D. 2014. Proxemics Play: Understanding Proxemics for Designing Digital Play Experiences. DIS 2014. Long paper. 10 pages. Florian ‘Floyd’ Mueller is giving a talk on 3rd June 2014 at IBM Research Australia on “Designing Exertion”, 4pm. The Exertion Games Lab had great success at CHI 2014, the premier conference in human-computer interaction: 10 Exertion Games Lab’ers presented in total 21 accepted submissions, including 4 full papers. CHI is the premier conference in human-computer interaction and attracted well over 3000 participants. The members of the Exertion Games Lab represented Australia’s largest group at the conference by far and had significant impact across all major venues, in particular highlights are: Rohit who presented his PhD research to a massive audience in the paper track but also in interactivity with Jeewon (and became a finalist in the videoshowcase), Jayden who presented his Honours work and became a finalist in the Student Game Competition, Betty who got keynote speaker Margaret Atwood to try out at Interactivity (and tweet about) her research on children’s book apps, Robert and Will who demonstrated with our support-crew Eric and Taylor CHI’s first BMX stunt-show showcasing Wouter’s LumaHelm (Wouter unfortunately could not attend, so thanks Robert and Will for helping Wouter out), Robert organized a workshop and Rich, Chad and Josh contributed to the GameJam4Research and presented their research in HCI and Sports. Well done everyone! All papers can be seen here. Together with Katherine Isbister, we created 10 Movement-based Game Guidelines, the first of their kind and validated by experts from indie, commercial and academic game design fields, to aid designers in creating engaging games involving bodily action. They will be presented to the public for the first time at CHI 2014. We developed Exertion Cards, they are “Things to Think About” when it comes to designing exertion games. They serve as design tools, helping game designers create novel and engaging games for the active human body, and are presented at CHI 2014. They are available here. We are very excited to have 21 submissions accepted at CHI 2014, the premier conference in human-computer interaction, to be held at Toronto, Canada. We have 4 full papers, 4 interactivities, 2 workshop organizations, 1 student game competition, 1 special interest group organization, 1 panel, 1 videoshowcase and 7 workshop submissions. Congratulations to everyone who did such a great job in getting the word out about the great work done in the Exertion Games Lab! Garner, J., Wood, G., Pijnappel, S., Murer, M., Mueller, F. 2014. i-dentity: Innominate Movement Representation as Engaging Game Element. CHI 2014. Long paper. 10 pages. 30 sec preview video. Video. Khot, R., Hjort, L., Mueller, F. 2014. Understanding Physical Activity through 3D Printed Material Artifacts. CHI 2014. Long paper. 10 pages. 30 sec preview video. Video. Mueller, F., Gibbs, M.R., Vetere, F., Edge, D. 2014. Supporting the Creative Game Design Process with Exertion Cards. CHI 2014. Long paper. 10 pages. 30 sec preview video. Mueller, F., Isbister, K. 2014. Movement-Based Game Guidelines. CHI 2014. Long paper. 10 pages. 30 sec preview video. Walmink, W., Chatham, A., Mueller, F. 2014. Interaction Opportunities Around Helmet Design. CHI 2014. Interactivity. 4 pages. 30 sec preview video. Video. Garner, J., Wood, G., Pijnappel, S., Murer, M., Mueller, F. 2014. i-dentity: Innominate Representation as Engaging Movement Game Element. CHI 2014. Interactivity. 4 pages. Video. Khot, R., Lee, J., Munz, H., Aggarwal, D., Mueller, F. 2014. TastyBeats: Making Mocktails with Heart Beats. CHI 2014. Interactivity. 4 pages. 30 sec preview video. Video. Sargeant, B., Mueller, F. 2014. How Far is UP? Encouraging Social Interaction Through Children’s Book App Design. CHI 2014. Interactivity. 4 pages. Garner, J., Wood, G. 2014. i-dentity: Concealing Movement Representation Associations in Games. CHI 2014. Student Game Competition. 4 pages. FINALIST. Mueller, F., Marshall, J., Khot, R., Nylander, S., Tholander, J. 2014. Jogging with Technology: Interaction Design Supporting Sport Activities. Special Interest Group (organizing). 4 pages. Mentis, H., Höök, K., Mueller, F., Isbister, K., Khut, G.P., Robertson, T. 2014. Designing for the Experiential Body. CHI 2014. Panel. 5 pages. Video. Khot, R., Lee, J., Hjorth, L., Mueller, F. 2014. SweatAtoms: Understanding Physical Activity through Material Artifacts. CHI 2014. Videoshowcase. 1 page. Video. Nylander, S., Tholander, J., Mueller, F., Marshall, J. 2014. HCI and Sports. CHI 2014. Workshop (organizing). 4 pages. Deen, M., Cercos, R., Chatham, A., Naseem, A., Fowler, A., Bernhaupt, R., Schouten, B., Mueller, F. 2014. CHI 2014 Game Jam [4Research]: Game Jams as a Research Tool. CHI 2014. Workshop (organizing). 4 pages. Byrne, R. 2014. Game Jam 4 Research. CHI 2014. Workshop submission for Game Jam [4Research] workshop. 4 pages. Garner, J. 2014. Design for Digital, Physical, Social Play. CHI 2014. Workshop submission for Game Jam [4Research] workshop. 4 pages. Goddard, W. 2014. Issues and Opportunities Facing Game Jams for Design Research. CHI 2014. Workshop submission for Game Jam [4Research] workshop. 4 pages. Segura, E. 2014. Jamming and researching the Play BOOST framework. CHI 2014. Workshop submission for Game Jam [4Research] workshop. 4 pages. Toprak, C. 2014. Game Jams: A Method for Starting, Working On and Completing Games. CHI 2014. Workshop submission for Game Jam [4Research] workshop. 4 pages. Andres, J. 2014. The Lights Track. CHI 2014. Workshop submission for HCI and Sports workshop. 4 pages. Khot, R., Hjorth, L., Aggarwal, D., Mueller, F. 2014. Supporting Autonomy in Physical Activity through Material Artifacts. CHI 2014. Workshop submission for Positive Computing workshop. 4 pages. Charbonneau, E., Buchanan, S., Bott, J., Mueller, F., LaViola, J. 2014. Dance Enhanced: Investigating How Earning Content Through Exertion Impacts Dance Game Enjoyment. Foundations of Digital Games (FDG) 2014. 8 pages. Associated paper. Video shown during presentation.